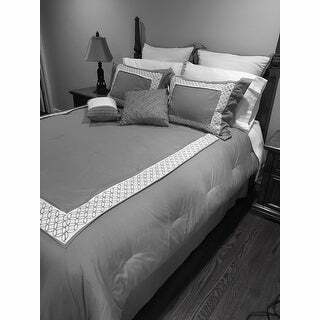 This bedding set is very nice quality and the color matches what was shown. Elegance meets simplicity with the Madison Park Carlton Comforter Set. The microfiber comforter and matching shams showcase a white border with an embroidered geometric fretwork design on a grey backdrop. Extra charm and dimension is added with the Euro shams, which reverse the color scheme by creating a solid white center with a grey border. A coordinating bed skirt drapes elegantly along the sides of the bed, giving a finished look. Two decorative pillows feature alluring quilted and pleated designs that complement the entire comforter set. I really did like the comforter, nice and soft material. However, it is not wide enough to even cover the sides of a king size mattress. Have to return it. Love this set! I love that it includes the Euro Shams and the decorative pillows. I also like that the comforter is warm but not too bulky to fit in my washer and dryer. A great product for the price and it looks great on my bed. The Madison Park Carlton Grey Comforter Set was just what I was looking for. We recently redid our bedroom with grey and grey-blue walls and grey carpets. This grey and white comforter set gives the bedroom the clean look I was going for. The quality of the material is great and seems like it will last for years to come. Glad I made this purchase!! I was a little skeptical about the set when I saw the price. All worries were set aside when the package arrived two days early. My wife and I both were extremely happy that the comforter looks better in person than it did in the photos. It is soft and the fabric is extremely comfortable. The only piece we don't use from the set is the bed skirt as we have a California King Captains Bed. We are both happy with the comforter set. I love this set. I love that it comes with decorative pillows and Euro Shams. It is beautiful. It is gray with a little white. I would definitely recommend to a friend. I normally don't write reviews. Since there were no reviews only that it's a "pretty gray" I took a chance. So happy I did! Fabric is soft, color is a very rich gray and made my guest bedroom look beautiful! I love this comforter set! it looks beautiful in our master bedroom. I added two grey and green pillows to it to add a pop of color! Excellent Deal! It’s on my master king bed as we speak. Very well made and comfy. I bought oversized euro square pillows for the sham covers and the set is just beautiful. I love the embroidery which matches the pattern in my draperies. It’s a winner. I would definitely recommend this product to a friend. High end look and feel. Absolutely beautiful set. Comfortable feels like a cotton and silk blend. I have a queen size bed so I ordered the queen set, however, my mattress is very thick with pillow top plus a mattress topper therefore making the queen fit just a little short. I would definitely order another from this company but will choose the king size next time. It could possibly be a nice comforter set but the fabric is very thin and there are a lot of skips ditches in the sewing of this comforter so that means that there are lot of loose strings everywhere iand some of them are even coming apart so for that reason I gave it to stars I would not buy it again and I opened it too late to return it. I purchased this for my 17-year-old daughter. She absolutely loved it! The quality is very nice and the fabric is soft. "Can I dry clean comforter?" This is machine washable. Spot clean for the pillows. "Does this set come with sheets?it doesn't say that in the description,but you said sheets are holding up great!" No. This set does not come with sheets.